The City of Wisconsin Rapids is dedicated to sustaining the water quality that we have come to enjoy through the years. In support of this initiative, we are a founding members of the North Central Wisconsin Stormwater Coalition. As part of the coalition, we are dedicated to educating our citizens as to the city's ordinances, ways everybody can help and fun ways to get children involved. Storm water sewer systems are designed to collect rainfall and excess water using the street's curb & gutter, where catch basins collect the water and send it to the storm water pipe beneath the street. The system also includes storm water leads that extend from houses or buildings located in high groundwater areas. The storm water leads collect excess rainfall and groundwater that reaches the building's foundation and sends the excess water to the storm sewer main. 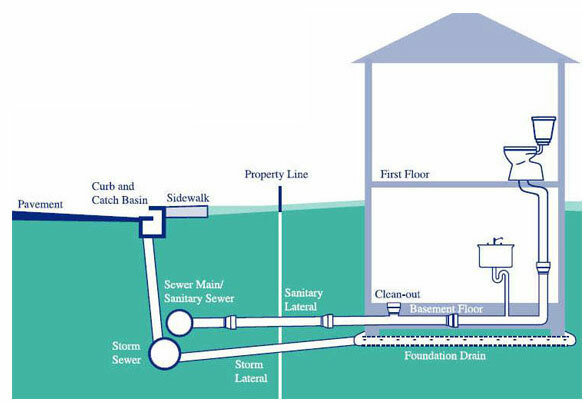 Basement backups may occur during storm water events because some storm sewer leads and basements are directly connected without backflow prevention mechanisms in place. In addition, many homes do not have foundation drainage systems that adequately protect the property from these storm events. Below is a link to a short clip that contains ideas homeowners can use to help reduce storm water leaking into the basement. Storm water Utility charges in the City of Wisconsin Rapids are based on the Equivalent Residential Unit (ERU). An ERU is the average horizontal impervious area of all single-family residential parcels within the City of Wisconsin Rapids, determined to be 2,620 square feet. Single-family residential parcels are charged the value of one ERU annually for City expenses for managing stormwater runoff. Multi-family residential parcels are assigned a fraction of an ERU annually, per living unit. Non-residential parcel charges are based on directly measured impervious area; base parcel charges (without credits or adjustments) are determined by multiplying the number of ERUs assigned to each parcel by the ERU fee. 2019 storm water fee is $35.04 per ERU per year. The fee is charged monthly by Water Works and Lighting Commission (WWLC). The revenue collected by the storm water utility is used for City storm water management, including maintenance and operational costs, as well as complying with DNR storm water treatment and discharge regulations.